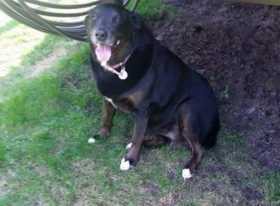 16yr old senior blacklab/Australian shepherd mix, neutered. Wearing a light pink collar with tags. Has a sensitive stomach eats homemade dog food. Going blind. Has anxiety. Always been an indoor pet. We love and miss her. A delivery person left the screen door open and she got out.